A National Building supplies company needed to refurbish old lighting in their plastics cutting warehouse. The warehouse is in use from 6 am until 7.30pm Monday to Friday and 6 am until 1 pm on Saturdays. The warehouse was fitted with 119 aging 400watt Metal Halide fixtures at a 9 meter mounting height. 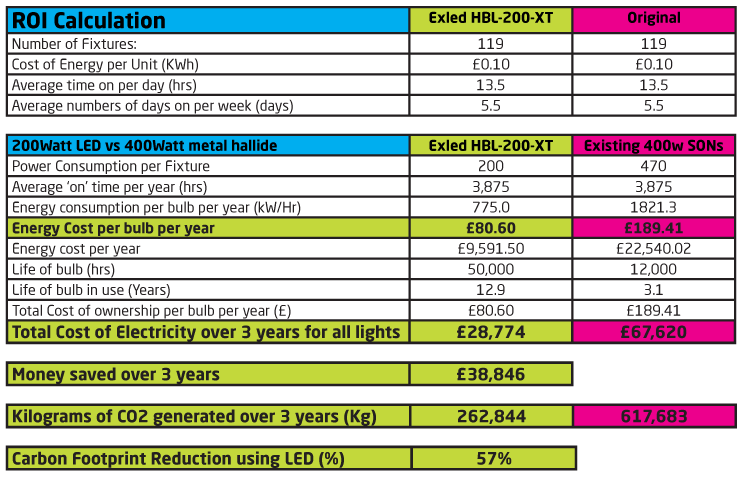 Although the ROI figures were good, the up front cost of buying the replacement HBL-200-XT High efficiency LED fixtures plus the contractor’s labour charges were outside the available Capex budget. The total cost to replace all 119 fixtures was £30,464. The customer, therefore, chose Exled’s rental option. Under this agreement, the lights were supplied on the basis of 1 months’ rental in advance plus 35 further monthly rentals. Exled arranged the installation of the new lighting fixtures and this was included in the total finance package. Under this arrangement the customer has brand new lighting installed. They are saving £1,079.00 per month on energy bills and paying out £954.31 each month on lighting rental. The High Bay lights supplied come with a 7 year manufacturer’s warranty, at the end of the 3 year rental period, the customer has the option to pay £100 and take full ownership of the lights. The energy savings will obviously continue as long as they are using the lights.